DIY Felt Christmas tree – Mumma, Did You Know? This was a quick shot as I realised that the tree might not survive the day. This is something that I was really quite pleased with myself about. I saw this idea online last year, maybe at this website or maybe somewhere else, and remembered for this year. I wasn’t quite sure if Little F would be too into it, but I thought I’d make it up and see. The local Spotlight didn’t have quite what I was after, so I bought one A3 piece of stiffened felt and a yellow piece of felt, and left (the other coloured are from scrap pieces I already had). 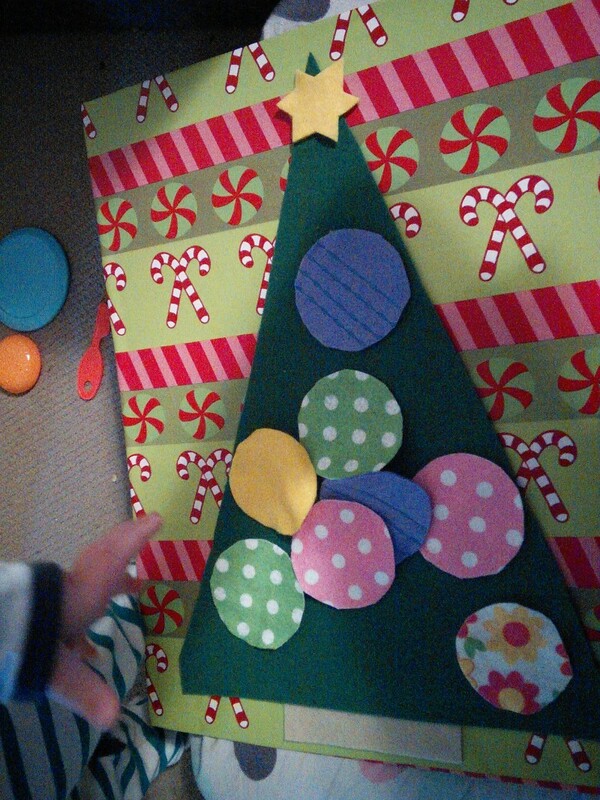 I cut out my triangle and a piece of brown for the trunk and was going to stick it on to the cardboard (which was the box for the toy kitchen) when I had the festive idea of putting wrapping paper behind it. I nearly broke open a new wrapping paper roll of black and white stripes and stars for this, then caught myself and went with what was already open. I bought this wrapping paper at Aldi last year, I think it was a 20m roll and there’s heaps left to use up. So, double sided tape, wrapping paper on to background, and then I ran out of tape after so my apprentice was safely in bed I got out the hot glue gun and stuck the rest of the tree together. I even got out the sewing machine and put some decorative stitches on the purple piece to make it look a bit more like baubles (I lost enthusiasm after, so only purple has this). Little F is quite pleased with his new toy and it took him five minutes to get around to ripping the whole thing apart. (I found more double sided tape to stick it back together) It’s now on our fridge where he pulls all the baubles off, then gets me to stick them back on, so he can pull them off again. He managed to get one to stick on his own but tends to ball them up too much so they just fall off again. We’ve been reading Puppy’s Christmas Star this week, and Puppy finds a place for his special star to go, on a special tree, so now we can do the same.